Knitting Relaxes Me: It fits! 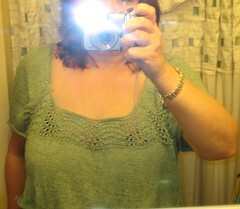 No, Buttercup (Rav link) isn't finished yet, but I did put it on waste yarn to make sure it fits -- and it does! The color is off - it's really a sort of blue-grey-green. However, this is the best I could do in my tiny downstairs bathroom. I'm doing a little modification - I'm making it more baby-doll shape, and am doing a wider trim at the bottom, a la Hapichick. As of Saturday, there's a new version of this pattern available -- I'm not looking at it, because this one is working for me! Oh, it looks great on you!! That ground squirrel - brilliant. Very nice! Too bad there was no squirrel popping out of your shower for that shot! I don't know what "putting it on waste yarn"...but it looks super cute! And how impressed am I with your modifications! Ooh la la! That looks great on you. Nice work!